Chauncey Billups, born in Denver, was an immediate on-court success. Having dominated at the highschool level, he was named to the All-McDonalds Team. Billups was then offered a full scholarship at the University of Colorado, where he continued to blossom for two years. In Chauncey‘s first few years in the NBA, he struggled to find his consistency, having moved around from Boston, to Toronto, to Denver and then onto Minnesota where he finally found his game. In the summer of 2002, Billups signed on as a free agent with the Detroit Pistons, who were being re-constructed by Joe Dumars. Having also acquired Tayshaun Prince, Ben Wallace, Richard Hamilton and Rasheed Wallace, the Pistons primed themselves for several years of stardom. Billups lead this star-studded team past the LA Lakers in the 2004 NBA Championship, winning the series MVP award along the way. In November of 2008, Billups was traded back to his hometown Denver Nuggets along with Antonio McDyess in exchange for Allen Iverson. Chauncey has since excelled with the Nuggets, having made the All Star game and he is leading the team to a stellar record along with Carmello Anthony. This spectacular poster features the man whose long journey to NBA champion and MVP candidate took him through Denver in the late 1990s, and saw him return to the Nuggets as a savior nearly a decade later. For this and other current NBA posters, visit www.sportsposterwarehouse.com. Bring your wall alive with one of the greatest moments in NBA slam dunk history! 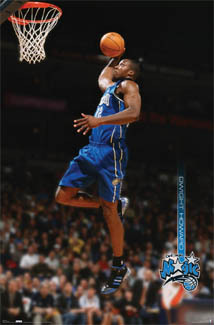 After his fan-favorite Superman dunk in 2008, Orlando’s Dwight Howard could only be a supporting cast member of the 2009 encore that launched the crowd in Phoenix at All-Star weekend into ecstacy. Emerging from the locker room in a green Knicks uniform, green shoes, a flourescent yellow arm wrap, and a green game ball, the 5’9″ Knicks guard Nate Robinson as “Krypto-Nate” brought the roof down with a leap over the back of 6’11” Howard on his way to a giant-sized power slam. Athletic, acrobatic, and downright hilarious! Printed on high-quality photographic stock from the original source, and complete with serialized NBA Properties hologram for authenticity. For this and many other great NBA prints, visit www.sportsposterwarehouse.com. Folks, the NBA season is underway, causing the staff here at Sports Poster Warehouse great excitment. There are plenty of players in new places, great rookies and veterans all looking to prove themselves. This post will be the first in a series of several dedicated to showcasing Sports Poster Warehouse’s early season predictions. Thus, the first one is this season’s “Starting Five” or first team all stars. For these and other great NBA posters, visit www.sportsposterwarehouse.com. Stay tuned for more NBA predictions!